The Place that's All About Kettles - yes the motorcycle, not a water heater! Let me ask you ............ who should join the Kettle Club? 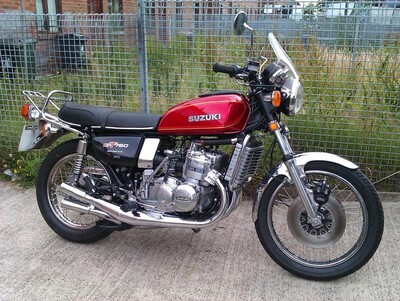 ......... and the simple answer is anyone who has an interest in one of the most characteristic and innovative motorcycles that the Japanese Motorcycle industry produced in the 1970's! The Kettle Club Committee is made up of a group of enthusiastic volunteers, whose main aim is to promote and spread the joys of Kettle ownership seeking to ever increase the number of Kettles on the UK roads and beyond. The Kettle Club is a Family orientated organisation welcoming both wives/partners and indeed kids into the Club, hopefully fostering the next generation of Kettle owners. We are keen to promote meetings of Kettle owners both at National and local events and can arrange discounts for Members attending some shows. 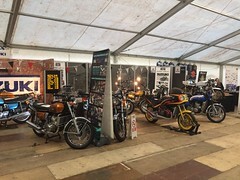 We want to see you at any main events we attend such as our National AGM in mid-July and the Carol Nash Classic Bike Show at Stafford in October where you can view our Members efforts at keeping their Kettles in tip-top condition or just talk about past ownerships or assist in helping you find the Kettle you want to own! Whether you have recently bought a Kettle or are considering reliving your youth buying a classic machine, it's "a must be place" to get invaluable help in a purchase or seeking technical advice on any aspect of Kettle ownership and since the introduction of our Members Forum which is free to Members, you're just a click away from some of the best Kettle experts in the World! The Suzuki GT750 is one of the most iconic motorcycles of the 1970's and we in the Kettle Club, share a passion to keep the legend alive. To promote, restore and most importantly, to RIDE our bikes. Whether they be as they come, a concourse restoration or a full blown special; any Kettle is a good Kettle in our eyes! The Kettle Club Forum has been running since 2014. Since then, it has greatly helped our members to engage in discussions about rideouts, meetings, technical info, problem solving, parts and bikes sales or any number of other matters that are of interest. The one great thing about our forum however, is the fact that it is exclusive to our membership. Guests, or non-members cannot access or view the Forum. Anyone wanting to join the Kettle Club, with all of the benefits that membership entails, should contact the Membership Secretary by clicking on the "Want to Join or Know More?" link to the right of this page. How the Kettle Club was set up ...... and how it is now!!!!!! In its standard guise, the Kettle, with its large, distinctive radiator and massive chrome 3 – 4 exhaust system; attracts a lot of attention, admiration ........ and jealousy!!! Within the limits of the technology of the era, the Kettle is an extremely comfortable and capable touring machine. 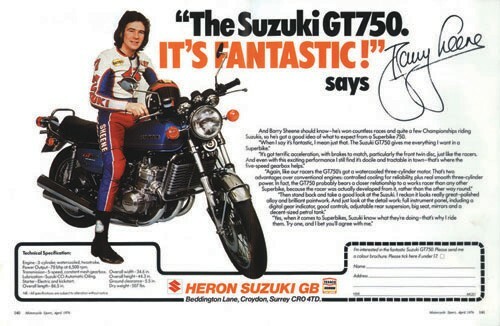 Indeed as the name suggests, the illustrious Suzuki triples range of the 1970’s, were designed as 'Grand Tourers' and at 750cc, there has never been a larger, road going, 2 stroke motorcycle. 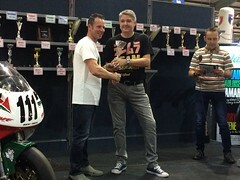 Endorsed by one of motorcycling's greatest legends, Barry Sheene; the Kettle is the embodiment of one of the most exciting decades in motorcycling. With a claimed power output of 70 BHP, it’s not going to worry many modern bike owners and it does require a firm grip when riding through twisty B roads ( hence the nick name "Flexi flier") but its smooth, turbine like engine is torque filled and its performance can still leave its owner with a broad grin, especially when it is accompanied by the aural symphony of a howling big bore 2 - stroke, as the revs near 7000 rpm! From Finland to New Zealand. From Canada to Australia . Throughout mainland Europe and Great Britain the ‘song remains the same’. From the lovely burble of a standard exhaust system to the GP race soundtrack emitted from a set of screaming expansion chambers or a 3 into 1. J models to B models, Dunstalls, Roca’s or Sanders & Lewis; the range of Kettle ownership attracts a broad spectrum of enthusiasts. Available to everyone; the Club has a comprehensive Regalia outlet, stocked with quality branded clothing and other items for the enthusiast. We also produce a professional quality quarterly magazine for our members, called "The Flexi Flier" which is packed with info. Every July, the Club holds an AGM and rally which host what is probably one of the largest gatherings of Kettles, anywhere in the world. 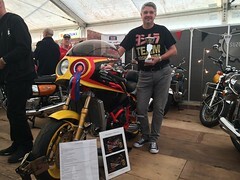 The Kettle Club exists for the Suzuki GT750 and is supported by a loyal and devoted group of members that have a passion for the bike they enjoy to ride, show and maintain. We hope you enjoy the site and that you too, might join us in the very near future.